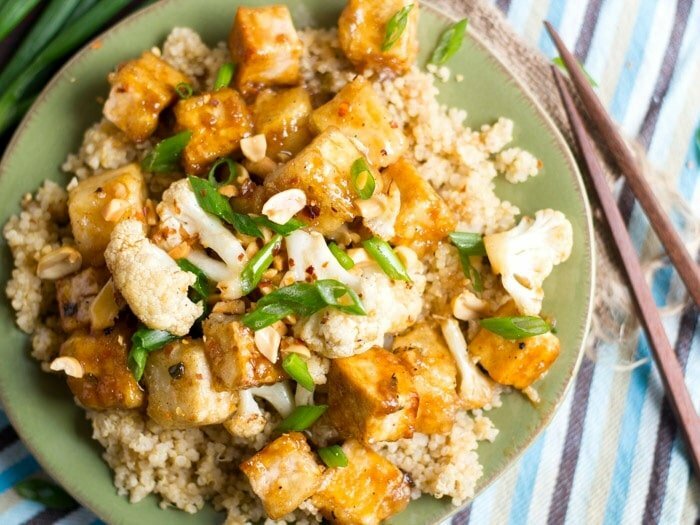 Crispy tofu and cauliflower florets are drenched in a sweet and savory bourbon ginger sauce to create this totally inauthentic but undoubtedly delicious vegan stir-fry. I recognize that I’ve been boozing up the blog like crazy lately. I barely let an entire week pass since my last whiskey-infused recipe, and believe it or not, I didn’t make this stir-fry in order to use up the last of that bottle. I actually went out and bought a whole new bottle for this one, and I’m so glad I did, because this was the best thing ever. This was also totally misguided, by the way, as lots of my recipes were. There’s a Chinese-fusion-ish dish that involves bourbon and chicken, and that’s where the inspiration for this comes from, but I can’t really say its an adaptation. Once I heard that such a dish existed I immediately assumed I knew what it was all about and threw this recipe together, all stir-fried with crispy cornstarch coated tofu bits. Bourbon chicken, as I now understand, involves marinating and roasting…or something like that? I’m really not concerned with the original anymore though, because my crispy bourbon tofu bits were bliss. I also debated doing this with crispy cauliflower instead of tofu, because everyone seems to dig the whole crispy Chinese cauliflower thing. In the end I decided not to decide, and make a tofu-cauliflower stir-fry. Place stir bourbon, soy sauce, maple syrup, rice vinegar, ginger and garlic into a small saucepan and place over medium heat. Stir everything to incorporate and bring to a simmer. Lower heat and allow to simmer, stirring occasionally, until the alcohol has cooked off (taste test), about 10 minutes. Stir cornstarch and water together in a small cup or bowl and add to whiskey mixture. Allow to simmer 1 minute more, until sauce thickens a bit. Remove from heat. Coat the bottom of a large skillet generously with oil and place over medium heat. 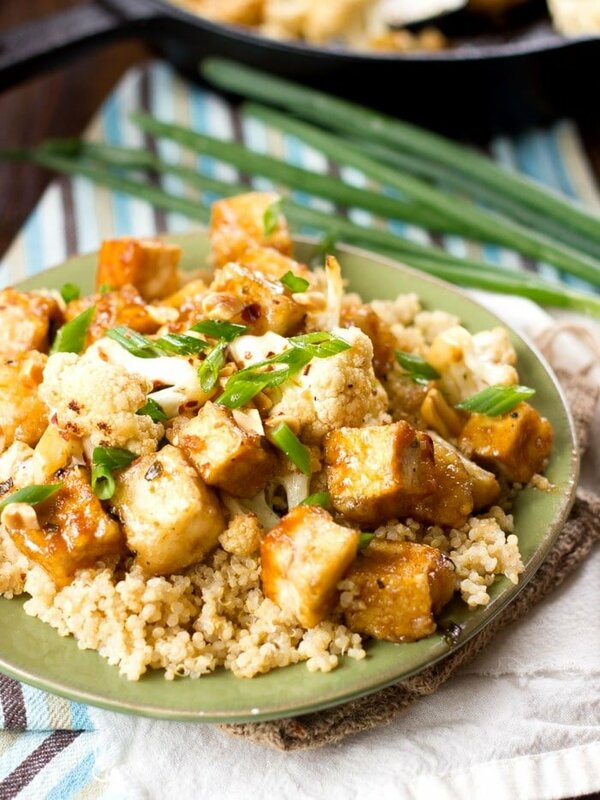 Working in batches if needed, roll tofu cubes in cornstarch mixture and transfer to skillet in a single layer. Cook until crispy on bottoms, about 3 minutes. Flip and continue cooking on each side until crispy (it's okay if you miss a side or two on some of the cubes). Add oil to skillet as needed between batches and continue until all tofu cubes are cooked, transferring each batch to a paper towel-lined plate when done. Coat skillet with another tablespoon of oil and raise heat to high. Add cauliflower and white parts of scallions. Stir-fry until cauliflower is tender-crisp and browned in spots, about 5 minutes. Lower heat and add tofu back to skillet, along with whiskey sauce. 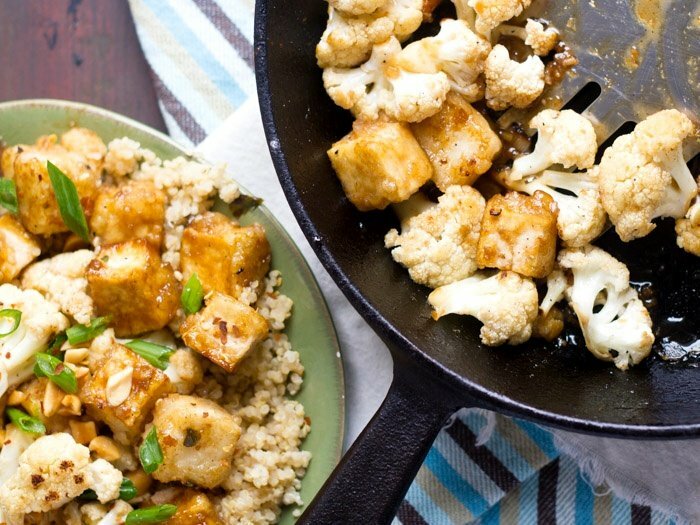 Cook just until sauce becomes bubbly and coats cauliflower and tofu, about 1 minute. Divide rice or quinoa onto plates and top with stir-fry. Sprinkle with green parts of scallions, peanuts and red pepper flakes, if desired. Serve. hi alissa, how do you keep your tofu crispy under all that sauce? whenever i have stir fry my tofu is amazingly crisp for the first couple bites and then the rest gets all soggy because of the sauce it’s lying under. do you have any tips? thank you!!! Hi Nicole! Thank you!! I *think* most liquor is vegan safe, but I’m not totally sure, and knowing that lots of wine and beer isn’t, I try to be on the safe side and always check before buying (or listing as an ingredient). Made this for the fam last night, Alissa, and everyone loved it! Thanks for that delicious dinner! Awesome! Glad to hear it! Thanks Erin!! This was soooooooooooooooo yummy!!! I LOVED it!!! I’m glad to hear it! Thanks Dee!